Oh my goodness I can’t believe it’s going to be Christmas in 2 months! I know it’s not even Halloween yet but as a busy mom, it is definitely best to plan ahead! I know most of you are also on a budget but want to plan an amazing Christmas for your family! Well I have the answer for you! What????? 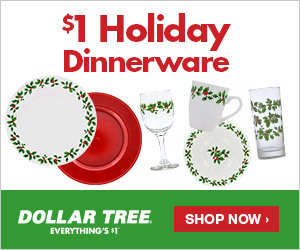 Dollar Tree has a website? Yes I know, I was amazed too! It is one of my favorite stores to pick up quick essentials and trendy decorating items for my house. I am on a major budget but I can pick up a few things from my local Dollar Tree to completely spruce up my home. Well now you can shop online at your favorite store! It is absolutely the perfect place to go to get all of your Christmas present supplies! I don’t know about you but I love to shop online whenever I can. I am super busy all of the time but especially during the holiday season so any errands that I can do online is so helpful! Get wrapping paper, ribbons, bows and tags all online and all for a dollar! I don’t know about you but I love the selection of gift bags at Dollar Tree! Honestly they are so much better than some of the bigger stores. I’ve always gotten complements on them. They have great cards as well! Go check them out and let me know how much you love them! You’ll definitely thank me later!